Division I Girls at 1:40 p.m.
Division I Boys at 3:00 p.m.
Tom Hickman, teacher and coach at the helm of Cape Henlopen in the seventies when they dominated Delaware track and field, died September 22nd at the age of 92. 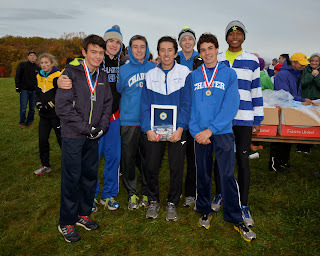 Charter's Kieran Tuntivate Selected as Gatorade's Player of the Year for Delaware Boys Cross Country! Lydia Olivere, the freshman from Padua, Chosen as the Girls Cross Country Gatorade Player of the Year! Padua freshman Lydia Olivere was voted Girls' MVP by the State Cross Country Committee. Olivere was unbeaten in state competition. A surprise to the evening's line-up was the announcement of co-MVPs for the boys: Tatnall's Stephen Garrett and Charter's Kieran Tuntivate, share the award for just the second time since first given in 1987. Both won their respective divisions in the State Championship. Tuntivate was the head-to-head champion in the New Castle County Championship and Joe O'Neill Invitational. However, Garrett's state records at Van Courtlandt (Manhattan) and White Clay along with a record 5k time during the season blurred the lines for a clear winner. Both boys surpassed the fastest 5k time at the Nike Southeast Regionals in Cary, NC, with Tuntivate edging Garrett at the line. Oddly enough, Tuntivate's cousin, Kyle Berseth (St. Mark's), shared the same award with Caesar Rodney's Matt Gordineer in 2000. 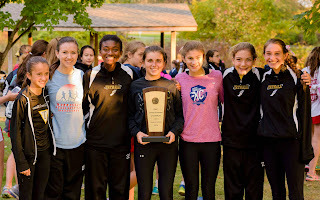 The ladies from Padua were the clear choice for the girls' Team of the Year, winning the Joe O'Neill Invitational, New Castle County Championships, and the Div I State Championships. Sallies ended up the winner for the boys when three teams vied for it (Charter and Tatnall). Sallies won the Joe O'Neill Invitational and the Div I State Championships, both by a tie-break over Tatnall and Charter, respectively. The Sals were 3rd at the New Castle Championship behind Division II Champions, Tatnall, and runner-up Charter. Padua's Marnie Guinta recieved the Girls Coach of the Year Honor for the second straight year. Tower Hill's, Annie Zerberkiewicz was the Boys Coach of the Year winner. The Hillers were the Division II runner-up, jumping from a 7th place finish in 2013. Charter's Kieran Tuntivate is the state's highest finisher in the Boys Championship Race - 7th place - 15:08.9! Padua's Lydia Olivere takes 13th place in the Girls Championship Race, 18:02.1! Stephen Garrett (Tatnall), finished 8th, just behind Tuntivate, clocking 15:09.2, in a fast race where four boys broke the 15 minute barrier. Charter teammate Kevin Murray was 12th overall running 15:19.9. Padua senior, Emily Paolucci, placed 22nd overall with a time of 18:13.2. Padua/Tatnall Girls are State Champions! Early pack - L-R L. Olivere, Macturk, Mills, Dunkley, Beston. Lydia Olivere leads late in the race. Photos courtesy of Jennifer Sullivan. Padua freshman, Lydia Olivere ran the fastest time of the day in 18:36 to capture DI title. Newark's Rachel Beston (18:55) placed 2nd over Padua's Emily Paolucci (19:08). Padua ran away with the team title talleying 30-81 over 2nd place Charter. Colleen Carney going wire-to-wire in DII Championship race. Photo courtesy of Geoff Heath, Blue Hen Photography. 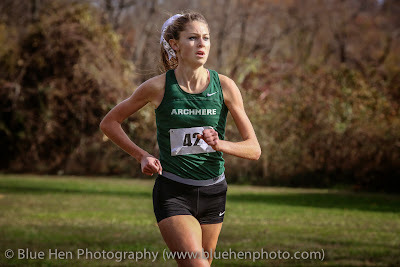 Archmere senior, Colleen Carney was the DII champ running 19:18. 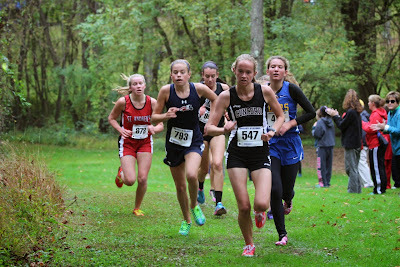 The DII runner-up was the 8th grader from Newark Charter, Emma Menzer (19:29). 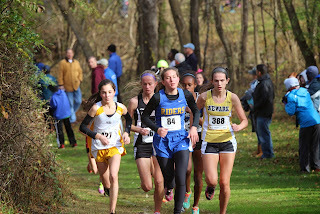 Last year's State MVP, Louisa Belk, of St. Andrew's, was 3rd place finishing in 19:46. Five girls improved or broke into the All Time List for White Clay Creek. Charter's Kieran Tuntivate & Kevin Murray. Coming down to another tie-break (reminiscent of the Joe O'Neill Invitational), the boys from Sallies edged Charter for the DI team title. 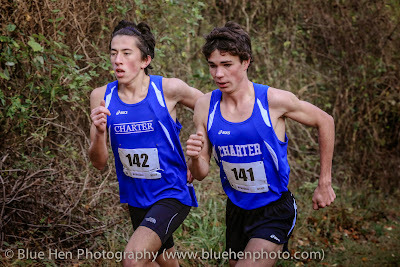 Charter senior Kieran Tuntivate (15:50) won the race over second place teammate, Kevin Murray (15:57). Salesianum junior Andrew Hally was third in 16:15. The brothers Garrett leading the DII race (Joey/Stephen). Photo courtesy of Jennifer Sullivan. 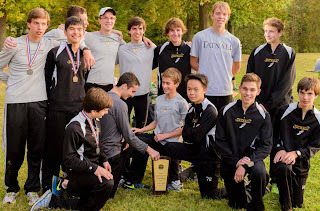 Tatnall boys placed all 7 runners in the top 15 to easily win the DII title over runner-up Tower Hill - 20-106. 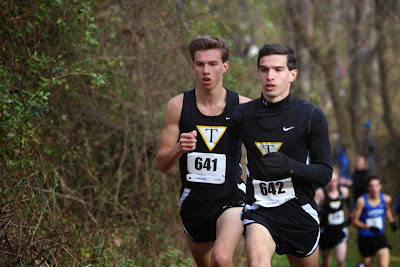 Tatnall senior Stephen Garrett clocked the fastest time of the day, 15:37, breaking a 16 year course record (previous record 15:58 run in 1998 by Eric Eckstrand of Salesianum)! 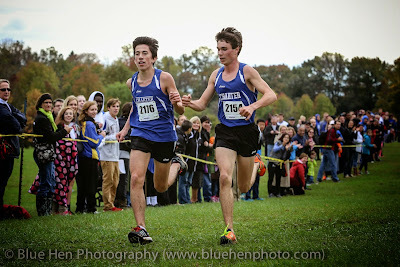 The runner-up was his brother, Joey Garrett (16:09) over Brandywine's Eamon McCoy (16:22). The day produced fast times with seven boys improving or breaking into the All Time List for White Clay Creek. Sussex Tech Boys/Caesar Rodney Girls Take Conference Wins! After delaying the meet two days due to weather challenges and the conference's decision to move the championship event from its historical home at Killens Pond to the unknown Indian River course, Sussex Tech boys capture their first team title. Nate Twining, the senior from Caesar Rodney, led all runners for the runner-up Riders. Charter Boys/Padua Girls are New Castle County Champs! Above photos courtesy of Lee Kauffman. Lydia Olivere, Emily Paolucci, & Caroline Foley. Early in the boys' varsity race. Photos courtesy of Geoff Heath, Blue Hen Photography. 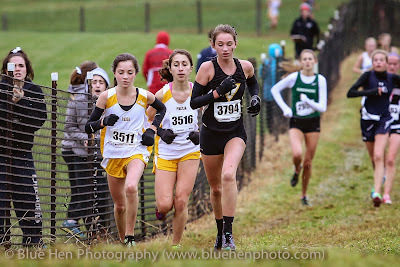 Freshman, Lydia Olivere (Padua) won the girls championship with a 14 second lead over Tatnall's Caroline Foley. 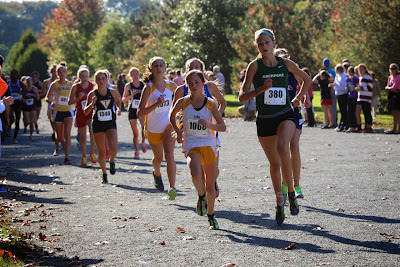 Padua easily won the girls' championship race scoring 42 points over 2nd place Tatnall's 69. DMA girls took third with 133. Senior, Kieran Tuntivate (Charter) led all runners clocking the 3rd fastest time since the County Championship moved to Winterthur in 2005 - 15:36 - on a cold, wet, blustery day. Tatnall's Stephen Garrett took 2nd (15:41), and Charter junior Kevin Murray placed 3rd in 16:03. This was the Charter's boys first county victory, talleying 50 points in a close match-up. Tatnall boys placed 2nd with 59 points followed by Salesianum with 65 points. Caesar Rodney Takes Both Boys and Girls Championships! Nate Twining & Rebekah Mills, both hailing from CR, were the individual winners. 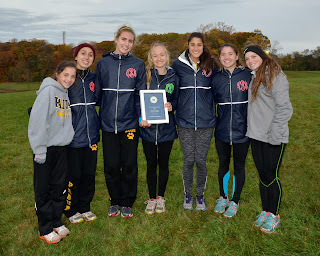 DMA Girls/Archmere Boys take Diamond Team Titles. Colleen Carney (Archmere) ran 19:55 to win the girls meet. DMA's Kyle Swain was the boys champ running 17:24. Photo courtesy of Lee Kauffman. Padua takes team title, led by freshman Lydia Olivere. Newark's Rachel Beston Near the Finish Line at Bellevue. Photo courtesy of Geoff Heath, Blue Hen Photos. Charter's Kieran Tuntivate and Kevin Murray Celebrate Before Finishing 1-2. Newark's Rachel Beston Captured the girls title in 18:38. Charter senior, Kieran Tuntivate, took the boys crown in 15:45. Hornets Take Both Team Titles! 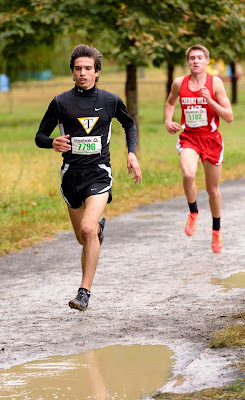 Tatnall's Stephen Garrett ran the fastest time of the year at Bellevue - 15:21! Senior, Kieran Hanrahan, of Tatnall, ran 18:47 to win the girls' race. Sallie's Boys/Padua Girls Take Championship! 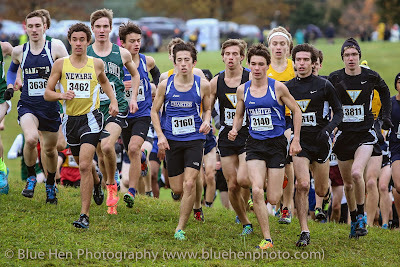 L-R Brandywine's Eamon McCoy, Charter's Kevin Murray, Tatnall's Stephen Garrett and Michael Flanagan behind Stephen, Tatnall's Joey Garrett, CR's Nate Twining, Sussex Tech's Sam Hete behind Nate, & race winner from Charter, Kieran Tuntivate. For the varsity boys' team championship, the first three places in the boys' race were within four points, setting up the stage for an interesting NCC race in just two weeks. Salesianum edged Tatnall, determined by the 6th runner (Sallie's Asa Bloom), to give the Sal's the title. Charter senior, Kieran Tuntivate, broke away from a tight group of four in the last mile to get the win (15:28). Tatnall senior, Stephen Garrett, took 2nd in 15:30. Charter's Kevin Murray was 3rd in 15:34, followed by Brandywine senior, Eamon McCoy in 15:42. The winning team, Salesianum, was led by Tommy Higley (6th) and Andrew Hally (7th). Newark's Jarod Wilson took 5th in 16:01. News Journal Article by Chuck Durante. L-R Newark's Rachel Beston, St. Andrew's Louisa Belk, Tatnall's Keiran Hanrahan, CR's Rebekah Mills behind Padua's Lydia Olivere, Archmere's Colleen Carney, Newark Charter's Emma Menzer. For the girls, Padua freshman Lydia Olivere (18:06) ran away from the Archmere Senior, Colleen Carney (18:38) in the last mile of the race to lead the Panda's to the team title. Caesar Rodney stand-out, Rebekah Mills finished 3rd in 18:50, followed closely by Padua's Emily Paolucci (18:52) and Tatnall's Kieran Hanrahan (18:55) to round out the top 5. The girls from DMA and Tatnall took 2nd and 3rd in the team championship. Stephen Garrett at muddy Manhattan. Photo courtesy of Bart Barry. Stephen Garrett, Tatnall, ran the #1 All Time performance at Van Cortlandt placing 9th in the Eastern States Championship Race - 12:28! Charter's Kevin Murray ran the 2nd fastest Delaware time of the day, 12:52, for #6 All Time, placing 26th in the same race. Joey Garrett, Tatnall, was the 3rd Delaware boy of the day running 13:04 for 42nd place. L-R Erin Spadaccini, Amber Owens, Lydia Olivere, Bridget Hughes, Hanna Apolostico, Emily Paolucci. The girls from Padua, took the team title in the Girls Varsity B division! Lydia Olivere, was 2nd place running 14:50, for #6 All Time! 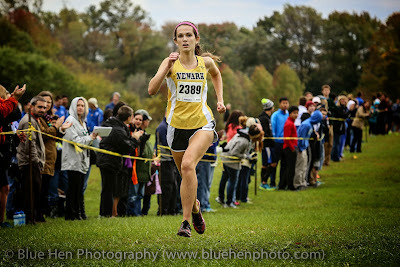 Tatnall's Caroline Foley ran the 2nd best Delaware girl's time of the day earning 6th place in the Varsity C division - 15:10. Padua's Emily Paolucci, placed 6th in the B race running 15:24 for the 3rd Delaware girl's time of the day. Concord's Katie Macturk has the early lead. CR's Rebekah Mills leading near the last mile. Senior Stephen Garrett finished 4th in the Boys' ROC event covering the fast 5k course in just 15:25! His brother Joey Garrett, a junior, broke the 16 minute barrier to place 35th in 15:59. Kieran Hanrahan (19:28) and Caroline Foley (19:31) led the Hornets placing 7th and 8th individually for a 3rd place team finish in the Girls' Invitational - Seeded event. In the Girls' Brown division, Padua freshman, Lydia Olivere, took 4th place in 18:12 to lead her team to a 3rd place finish! In an exciting Boys' Brown race, Charter's Kieran Tuntivate (15:39), placed 6th overall behind a meet record, wire-to-wire victory from Easton Area's Colin Abert (14:55). Kevin Murray, a junior from Charter, placed 12th in 15:42, contributing to a 6th place team finish out of 41 teams competing. Senior Colleen Carney posts the fastest DE performance of the day placing 2nd in the Small Schools race running 19:35! Caesar Rodney's Rebekah Mills (20:14) ran the second fastest Delaware time of the day with a 2nd place finish in the Championship race. Tommy Higley (17:07) and Andrew Hally (17:15) place 3rd and 4th individually for the 2nd place Sal's in the Boys Championship division. Delaware Schools Well Represented at Large Out-of-State Invites! Photo courtesy of Annie Zeberkiewicz. Brendan Harris Wins the Varsity E Race for the Runner-Up Team from Tower Hill, Running the Fastest Delaware Time of the Day in 16:42! 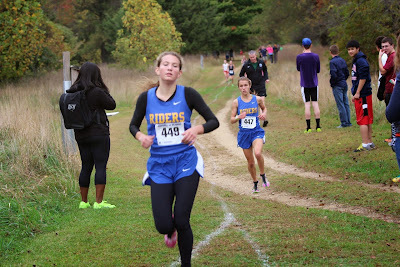 Caesar Rodney's Rebekah Mills (19:20), is Runner-Up in the Varsity A Event for the 3rd Place Riders! Eamon McCoy leading at the bottom of "the Dip" - photo courtesy of Michelle Flanagan. Brandywine's Eamon McCoy Wins the Small Schools Championship Race on the Hilly Hereford, MD 3 mi. Course - 16.39! Photo courtesy of Mike Losapia. Colleen Carney at Maymont. Photo courtesy of John Jordan. Colleen Carney, of Archmere, wins the Private School Championship Division in 19:16! Salesianum Takes 2nd Place in the Boys Invitational Division Paced by Andrew Hally (16:22) and Tommy Higley (16:24), Placing 3rd and 4th! Padua Wins the Girls' Varsity Challenge Race, Led by Emily Paolucci (18:50) and Lydia Olivere (18:54) Placing 3rd and 4th! Joey Garrett, 5th place finisher in JR race. Stephen Garrett Led All Hornets Running a Fast, 15:31, for 6th Place in the Senior Class Race. The home team senior, Ashton Dunkley, won the girls race in 19:12, but it was not enough to handle the depth of St. Andrew's, who edged the Cavaliers with a 74-81 victory. Sussex Tech's 1-2 finish - Sam Hete (17:17) and Ben Bamforth (17:35) - helped to secure the team victory over Appoquinimink (63-69). Newark's Jarod Wilson crosses creek. Jarod Wilson Places 18th in a Field of 429 Finishers Running 16:37. Rachel Beston Places 20th in 19:51, in the 379 Competitor Field. Newark boys were 25th out of 63 teams competing. 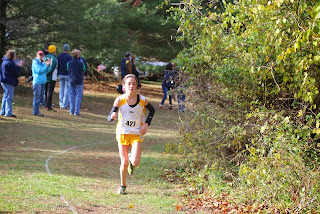 Tatnall 8th Grader, Olivia Harden, took 9th place in the Freshmen race, running 13:00.04. Her teammates Stephen Garrett (9:39.41) and Ben Boswell (9:55.05) finished 3rd and 10th in the Senior class race while Michael Flanagan finished 6th in the Junior boys' race running 10:08.00. Ursuline Senior, Courtney Wallace, earned 9th place with a time of 12:16.87. Padua's Lydia Olivere………….Eamon McCoy, Brandywine, and Jarod Wilson, Newark. Padua Girls Show Strength Early Capturing the Team Title. Salesianum Boys Finish Third Overall to Lead Delaware Teams. Padua freshman, Lydia Olivere, ran the fastest time of the day in 19:00 - tying for #7 All Time! Teammate Amber Owens was runner-up in the same race; DMA's Nicole Harris took 3rd in 20:32. In the Sophomore race, Padua's Maddie Olivere took first running 20:35. Rachel Beston, from Newark, crossed the line in first place in the Junior race running 19:45. Caesar Rodney junior, Christine Marks was 2nd place in 20:09. In the Senior competition, Caesar Rodney's Rebekah Mills ran 19:23 as the runner up to West Chester Rustin's Jessica Delviscio (19:15). Padua senior, Emily Paolucci was 3rd running 19:32. In the Freshman race, Kevin White of Newark Charter took 1st place running 18:00. Brandon Smith of Newark was close behind as runner-up in 18:03. Dover's Sean Saxton was the top Delaware boy in the Sophomore race, finishing 3rd in 17:33. For the Juniors, Salesianum's Andrew Hally took first in 16:39. In the Senior race, Brandywine's Eamon McCoy ran the fastest Delaware time of the day to finish 2nd behind North Penn's Ryan Tung (16:11). McCoy's time of 16:18 is #10 on the All Time List at White Clay Creek State Park. Newark senior, Jarod Wilson was the 2nd fastest Delaware boy of the day - placing 4th in 16:33. Charter Wins Girls' A Division; While Runner-up in Boys' A. Tough competition hampered by extreme heat and humidity! Kevin Murray (Charter) wins the A Division running the best Delaware time of the day - 16:26. Newark's Jarod Wilson is the A Division runner-up running 17:02. Eamon McCoy (Brandywine) takes 2nd place in the B Division with a time of 16:48. Rebekah Mills (20:09) and Christine Marks (20:26) of Caesar Rodney take first and second in the A Division. Mills ran the fastest Delaware time of the day. The Riders showed their depth in sweeping the JV A Division team scoring. Freshman Sofia Alfieri was the first runner from Division A champion Charter placing 5th in 21:25.